Selected to be a keynote presentation at the 2018 CIRP LCE conference in Copenhagen. 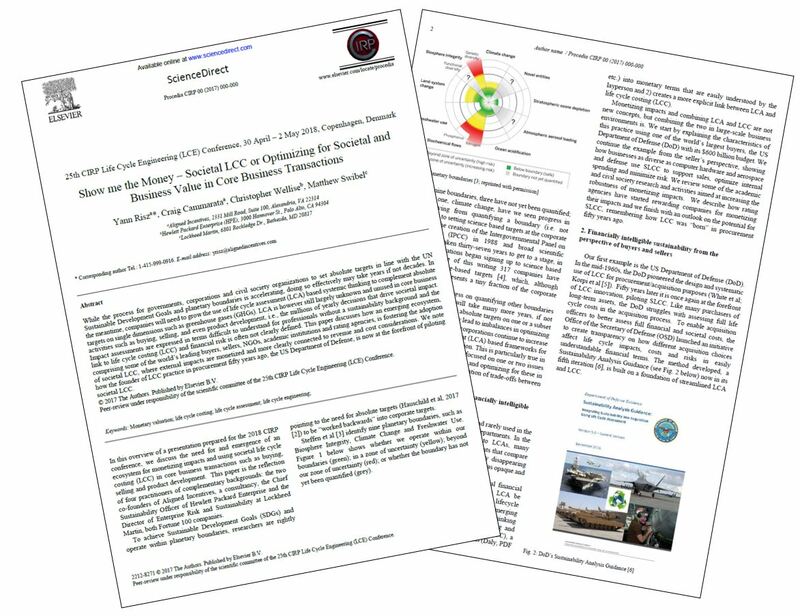 Co-written with Chris Wellise, the Chief Sustainability Officer at HPE and Matthew Swibel, Director of Enterprise Risk and Sustainability at Lockheed Martin, this paper explores the growing trend of translating the societal impacts of products into monetary terms and assessing those societal life cycle costs in parallel to traditional Total Cost of Ownership measures. Textile Exchange Sustainability Conference, September 9-13, 2017, the Textile Exchange’s yearly conference in Washington, DC. Plenary session October 10, 4.10-5.10pm. Jeffrey Hogue, Chief Sustainability Officer at C&A, invited Aligned Incentives to co-present their footprint and materiality work. Aligned Incentives’ Managing Director Yann Risz will address questions such as: How to develop GHG and water footprints that enable higher return sustainability investment decisions? How to move from optimizing for less emissions to optimizing for less damage to society and more business for the company? Energy Exchange, August 15-17, DOE’s yearly flagship event in Tampa Florida. On August 17, 2017, Aligned Incentives and its client the DoD presented a session on properly valuing water. 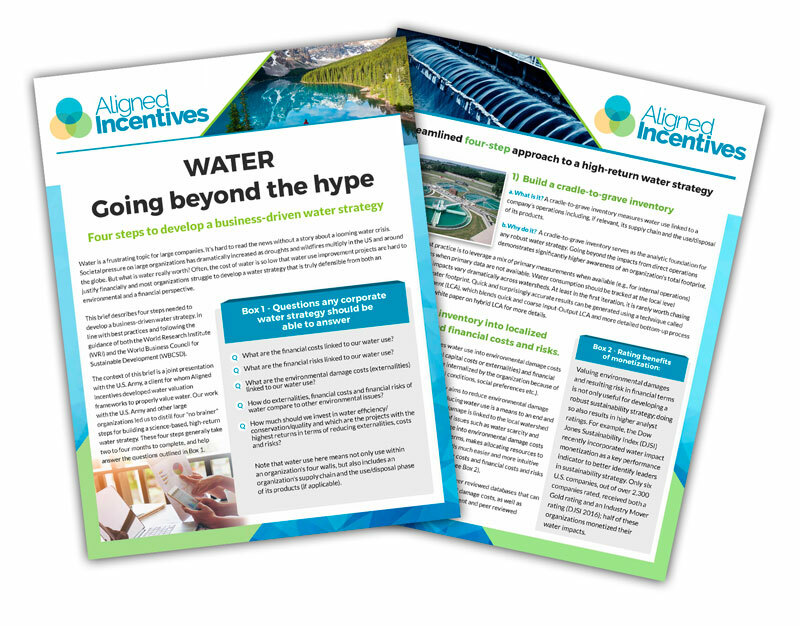 Specifically, Aligned Incentives laid out 4 basic steps that streamline the development of a financially and environmentally robust water strategy. 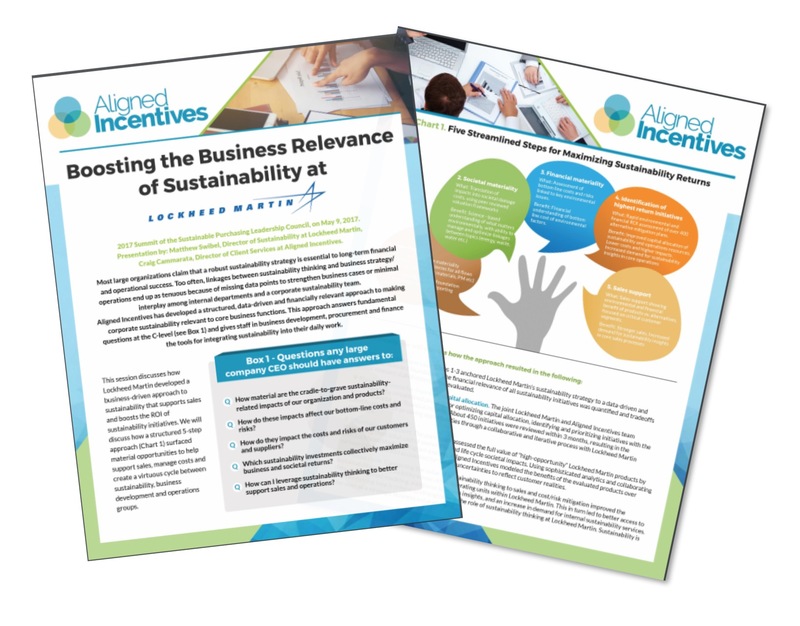 Click below to download the 4 critical steps to understand impacts, costs and risks of water for your organization, and how to identify water initiatives with the highest environmental and financial returns. We hope that you enjoyed the session – in case you missed it email info@alignedincentives.com to receive a personalized tutorial free of charge. Click below to download summary of our presentation.